This religious tapestry "Icone Madonna" is inspired from an iconic representation of the Virgin Mary and the Christ child. The original from 1380 was the work of Theophanes the Greek, who was the founder of the Novgorod school of icon painting. Born in Constantinople, formerly Byzantium, he became one of the greatest painters in the Russian school of painting. He produced many frescos and paintings of religious figures, including in many Russian cathedrals and churches and in the Moscow Kremlin. Here we see the Virgin an Christ child in an embrace, surrounded by golden haloes. 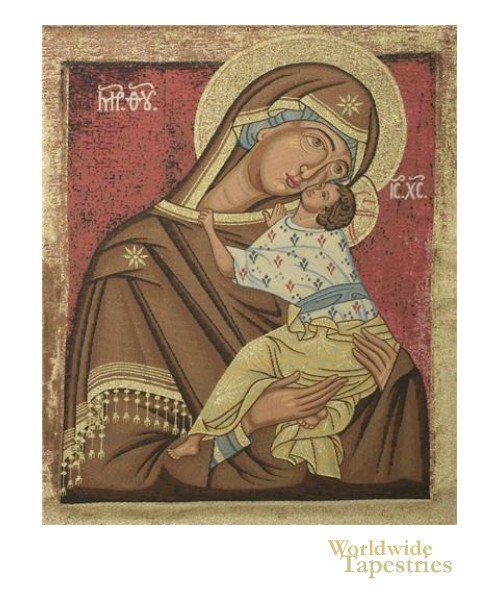 This religious tapestry "Icone Madonna" is lined and has a tunnel for easy hanging.